In January 1918, Corsham lad Harold Simmons of Pickwick Road, wrote a letter to his father serving at home with the Royal Army Service Corps (RASC). Like many children, he would have seen little of his father through the war years and his enthusiastic sharing of news conveys how much he must have been missing an absent and idealised parent. Dear Dad, just a few lines to tell you about us. We have 6 German prisoners in the Methuen Arms, all of them can talk English, and there are 2 guards there. One has a revolver in his belt, and they have ploughed Farmer Fry’s field and they go to Chippenham every night. Now they work up Bradford Road, of course that means they have to pass our house every night and morning. Thank you for the birds on cards, all the boys are saving them here. Now I am in standard 2 I find that the sums are harder. I have still got the pencil box you gave me. I am glad to tell you that I am getting on alright with the piano. Roy loves to play with me on the pavement nights. Mam is sewing. Heaps of love from your son, Harold. Sadly, Harold died of consumption on 7th August 1918 – and so did not see his father again. This story was donated by Corsham Commemorates Researcher, Pat Whalley, as told by the soldier’s grandson, Jack Simmons. 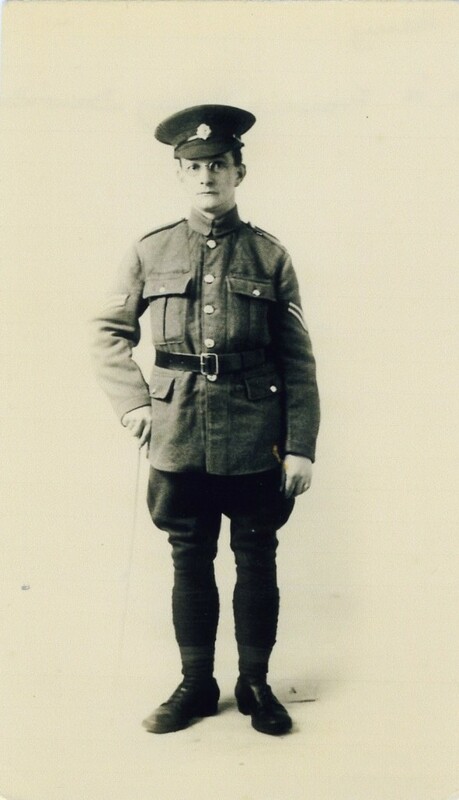 F Simmons, Harold’s father who in January 1918 was serving in the RASC. Sadly, son Harold died in August 1918 and father and child would not see each other again. ← The Batters Trenches in Corsham – Practice before you go, lads!